This is not a review, and as you read it, you’ll see why. I can’t review this book, because I can’t be critical of it. I just loved it way too much, and it spoke to me on a level that so many books have never accessed. I get a little personal about my own interpretations of the themes that are played with (which makes me nervous because I’m probably wrong about all of it, but part of the delight of reading a book like this is knowing everyone will take something different away from it, and none of us are wrong), and probably because of that, I shouldn’t call it a review. I can’t review a book that became such a personal, intimate journey. I just can’t. I just sat down to write this review, and kind of shook my head as I pictured how the people at Tor must hate it when people like me review books way too early. Sorry, people at Tor. Sometimes the idea of holding in my excitement until April 22nd is painful, so I jump the gun. My goal in writing this review really isn’t to aggravate the hell out of the publishing industry (who would prefer me to wait until publication date or slightly after, like I normally do). My goal is to try to get as much hype about this book buzzing as possible. Because it rocked my world. Last year the book that I couldn’t stop thinking and talking about was Love Minus Eighty by Will McIntosh. Love Minus Eighty taught me an important lesson: I love social SciFi. I love the books that take our world, and twist it just enough to really make me examine life and all the things in it through a different lens. I like books that make me feel like I’ve lived four lives while reading them, and learned a million different things about myself. I love the books that are a mental exercise, and force me to examine just how the cultural wheels turn and stay greased. I finished Love Minus Eighty last year, and since then I’ve been endlessly looking for my next fix, the next social SciFi book that would work its way under my skin and into my psyche just as much as that one did. I didn’t think it would be possible, and I have been endlessly lamenting the fact that you can’t read a book for the first time over and over again. Then I got my hands on Afterparty. Oh, Afterparty, how you worked for me. You did everything Love Minus Eighty did, and you did it so well. Gregory’s world is in the very near future, which makes it feel even more real, which in turn will make this book even more thought provoking for readers. Combine that with his powerful no-words-wasted writing style, and characters that are mesmerizing, this book has the potential to deliver quite a punch to readers. Afterparty is genre bending, which is part of the delicious thrill of it. This is part thriller, part SciFi, part social commentary, and its own animal. It refuses to be defined or contained, and it shouldn’t be. Afterparty truly takes on a life of its own once you start reading it. Some of the advanced technology will serve to remind readers that this book isn’t taking place “now” but in the future (like the printers that people use to make drugs, which remind me quite a bit of the new 3D printers). Likewise some of the social issues (like cigarettes are the next hot smuggling item) are a fascinating look through the lens of what-could-be. Much like Love Minus Eighty, there is a lot going on in the periphery of the novel. Many of the social issues that Gregory forces the readers to examine aren’t presented in an in-your-face way, but a more subtle way with softer cues for readers. That’s part of the beauty of this novel. Everything matters, but it might not be evident why it matters right at first. The fact that so much of this book is happening on the sidelines also makes Afterparty feel like it isn’t an in-your-face novel, which I truly appreciated. With weighty subjects like the merging of science, medical issues, morality, and religion, being in your face is a hard thing to avoid. Gregory side steps it gracefully. That truly makes Afterparty a novel everyone can read and enjoy. The prose is tightly woven, and there is a sort of dark humor that threads its way through the novel. You’ll probably find yourself laughing at things that might not seem like they should be funny, but even that had a carefully crafted feel to it. So much of the novel felt like Gregory was making readers examine themselves, and the world around them, in a sort of warped way. Once you get to know the protagonist, one Lyda Rose, you’ll see that looking at the world, and yourself, through a twisted sort of jaded and darkly humorous looking glass is absolutely perfect. I have to admit that Afterparty speaks to a part of me that rarely gets spoken to. I have a Bachelor of Science degree in health science. I have been through two cancer treatments, and due to my back issues, I spent nearly two years on heavy painkillers and in pain management (so very glad that’s over). Being so intimately tied to the medical community for so long has given me a very unique window into the world of medication and just what it does for (and to) people. Technology is amazing, and it is intimately tied with medicine and “the cure” for so many things. Without technology, I wouldn’t have been able to have the surgeries I needed so I’d probably be paralyzed right now. I wouldn’t have been able to do my cancer treatment, either, so I might be dead. Technology is fantastic, and it saves lives. Hell, it’s saved mine. Afterparty takes it one step further. Gregory blurs the line between medicine, science, technology, and religion, and asks readers to really look at just what we are doing with all we have access to. That’s the magic of it. We see these drug commercials on the television every day, back to back sometimes. Half the ad is a guy living a fantastic life, laughing with his wife and throwing a dimpled toddler in the air while the summer sun catches them all just right. The other half is all the side effects of this miracle drug you should ask your doctor about. Then, at work, everyone knows the answer to every medical problem because they are all suddenly “WebMD Doctors.” Mix into that the interesting moral conundrums of “playing God” and BAM, you have our own complex cultural stew. Gregory mixes all of this together in a pot, stirs it vigorously, and turns it into a book that you won’t ever forget. Love Minus Eighty did it with social networking. Afterparty does it with the morality and relationships of technology, science, and religion. Amazing. Absolutely astoundingly amazing. Afterparty is smart, but it never talks over your head. It’s funny, but with that dark tone that feels just so right. It’s so realistic it absolutely chills the marrow in my bones with the possibilities it plays with. The plot is fast moving and tightly wound. The characters are broken down, but strong and resourceful despite it, and so well realized when put into the context of everything they’ve been through and are going through. Everything about this book spoke to me on a very deep level. It just worked, and much like Love Minus Eighty, it has haunted my mental pathways long after I turned the last page. I love books that leave echoes. Afterparty was so amazing, I can’t even figure out a star rating for it. Just read the damn book. You’ll see. You should have it firmly on your radar. It’s amazing. Ha… I got a little excited. This book is definitely on my radar, and it’s also pretty high on my list of books that I need to prioritize. Honestly, I think it’d be next up after I finish what I’m currently reading, if only I hadn’t gotten approved for a book today that made me squee with delight because I want to read it that much! But Afterparty is definitely high up there, and I’m looking forward to reading it. Glad to know that it exceeded your expectations! I can’t wait to see what you think of it!! Whoa, this one sounds intense. Haha, I think the lovely people at Tor might forgive you for gushing about this one early ;-). I will definitely be keeping my eye out! 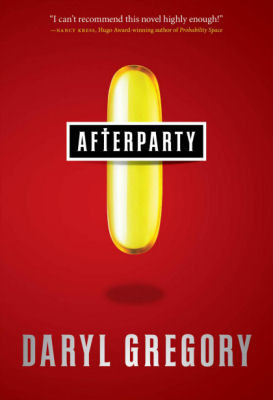 I just heard Daryl read from Afterparty – so excited to see it get the love. Daryl Gregory is an auto-buy for me now. All of his books and short stories have absolutely blown me away. Afterparty is my first book I’ve read by him. Definitely won’t be my last.